A levee is an embankment generally constructed close to the banks of a stream or river; intended to reduce the risk of flooding for the neighboring properties. 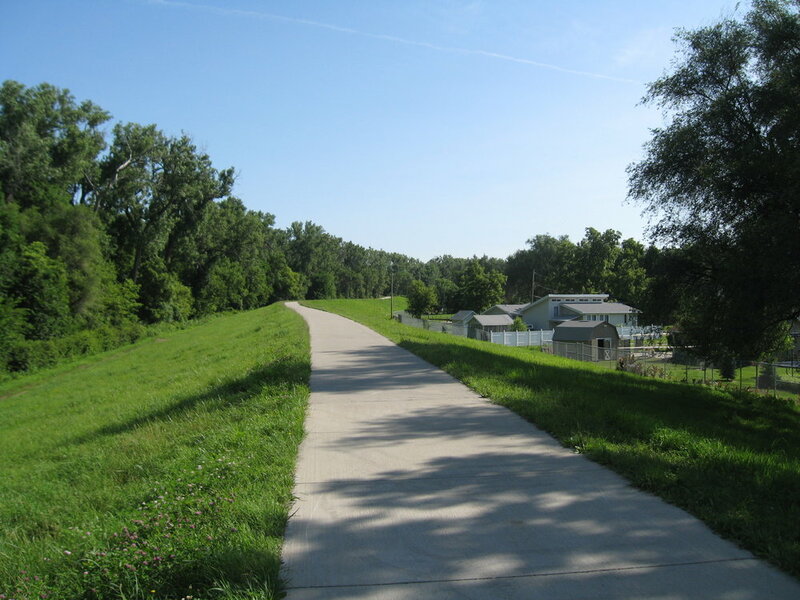 The levees in Council Bluffs were originally designed and constructed by the U.S. Army Corps of Engineers to reduce the risk of flooding from the Missouri River to the City. Without the levees, approximately 64% of the incorporated city limits would be at greater risk of flooding. The map below shows the leveed area of Council Bluffs. Even after all preventative flood measures have been taken, there is still a risk of flooding. With all of the tools individuals and government agencies use to reduce flood risk, risk cannot be eliminated completely. This is known as Residual Risk. The Residual Risk graphic has been designed to help you understand the collective steps that can be taken to reduce the risk of flooding. Tools range from zoning regulations to structural flood control projects such as levees. Like other important investments, such as homes and cars, levees require continued maintenance in order to ensure their performance and longevity. At over 60 years old, the City’s levees require continued maintenance as well as rehabilitation of aged components. Browse below to view photos of the ongoing levee maintenance and rehabilitation projects in Council Bluffs. The National Levee Database (NLD), developed by the U.S. Army Corps of Engineers (USACE), is the focal point for comprehensive information about our nation's levees. Authorized by Congress in 2007, the database contains information to facilitate and link activities, such as flood risk communication, levee system evaluation for the National Flood Insurance Program (NFIP), levee system inspections, flood plain management, and risk assessments. Use the Cost of Flooding tool to estimate the cost of damages if a flood struck your home. What are your chances of experiencing a flood? These animated scenarios demonstrate how various factors impact different neighborhoods. Assess your flood risk, find trained flood insurance agents, protect your home. Learn about flood risks like leve failure and Winter Rainy Season. Launch the Levee Simulator to see how levees work to reduce flood risk and what happens if they fail. Are your home and loved ones safe from floods? How much protection does the levee really provide? What do you need to know to be safe? The American Society of Civil Engineers has created an informational brochure to help individuals and communities better protect themselves against future flood threats. Please follow the link to view the brochure.